Basically, this is like a dozen key limes. 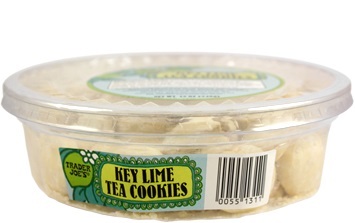 It’s not often we get an outrageous blast of lime flavor in the pastry aisle, but that’s exactly what Trader Joe’s delivers with their new Trader Joe’s Key Lime Tea Cookies. These tiny, bite-sized cookies pack shockingly big lime taste into each dainty nibble – a delightful way to mix-up your cookie munching schedule, tea or not. What it is: Small, crunchy cookies with lots of lime. Worth it: Yes. Shockingly flavorful! Take one bite of these and you’ll see what I mean about the lime flavor. It’s rare to have a Key lime pie, let alone a cookie, that contains this much lime flavor, and doubly surprising is that Trader Joe’s isn’t using any artificial flavoring or other tricky additives to achieve the goal. The only flavoring going into these is natural Key lime flavor. Wow. Seriously, try one. It’s nearly too much lime flavor – like jelly-belly level lime flavor. Limier than a British sailor. That limey. We haven’t looked at many of Trader Joe’s lime offerings, apart from the keffir lime in their Thai foods. Key lime is more than just an exotic marketing term – Key limes are a distinct sub-speices of everyone’s favorite green citrus fruit. Much smaller, rounder and more delicate than the typical Persian lime, the Key lime is actually native to South East Asia. It earned its modern moniker when it was brought to the Florida Keys by Spanish explorers and naturalized there, before rising to wider prominence in the early 1900’s due to the invention of its most popular form of consumption – the Key lime pie. Other than the lime, these are pretty standard little butter cookies, thoroughly dusted by powdered sugar. By themselves they would be sweet, crumbly and pleasant little treat, but the extra lime taste really sets them aside from the crowd of cookie offerings at Trader Joe’s. Good though they are, these tea cookies don’t go particularly well with tea. Their dainty size and powdery complexion makes them look well upon a saucer, but that aren’t particularly practical. The best tea cookies, or tea biscuits as they are also known, are dunkable team players. These tea cookies don’t do either of those things very well. They’re small enough that you can’t dunk more than, maybe, a third of the way down, and thick enough that they don’t really saturate well, and the powder means that your finger end up tacky and dusty if you try it. For enjoying with a good cup of Ceylon black I personally prefer a milder cookie that quietly sops up the brew – something for a pleasant exploration of texture instead of taste. Nevertheless, these Key lime cookies are palette pleasers, and if sitting down to some tea gave me an excuse to help myself to one or two I’d be pretty likely to do so. Would I Recommend Them: Yes indeed. Flavorful and and rich. Would I Buy Them Again: Yes, these are up there with my favorite Trader Joe’s cookies. Final Synopsis: Small butter cookies with big lime flavor. Just so you’re aware, “natural [ ] flavor” doesn’t mean the flavoring comes only from the food referenced; it just means that the flavoring isn’t artificial. But the term “natural” is almost entirely unregulated in food manufacturing and marketing. In this case, it’s likely extracts and compounds from a variety of sources which originated nature, as opposed to being manufactured in a lab, blended in the right proportions to taste lime-ish. For lime, a truly “natural” flavoring from the fruit itself would be lime zest, lime juice, or maybe lime oil. Your comment made me do a little digging. Here’s a good article from “Today” that goes into depth behind “natural” vs. “artificial” flavoring. Consider me educated! “Natural flavoring” is just another marketing term that doesn’t actually signify what most people (myself included) think it does. I’m glad that made sense. Interesting point in the article you linked that artificial may be “better” than natural. There’s not a lot of clarity in these simple terms. I’ll get off my soapbox now. I enjoy your reviews! Just got these and I also got a little salt at the end that made it perfect. There is no indication on packaging where these cookies are made. Anyone know the answer to this? Karen- The Fearless Flyer says they’re made by an Arkansas company.